A severe investment miscalculation leads to valuable lessons about the tricky psychology and thorny arithmetic of the market. 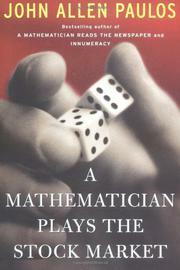 Bestselling mathematician Paulos (Innumeracy, 1988, etc. ; Mathematics/Temple Univ.) invested in WorldCom, he averaged down and bought more WorldCom, he bought WorldCom calls, and he bought WorldCom on margin. He lost a lot on WorldCom, but since that loss gave rise to this account, it’s a gain for investing readers. His uncommonly cogent text does not promote a secret investment method for attaining riches. Rather, it lucidly clarifies many of the mathematical and statistical influences on the stock market. With accustomed humor and apt examples, Paulos tackles complex computations that are vaguely understood and frequently misapplied by Wall Street pros. He explores the deficiencies of both technical and fundamental analyses. Diversification, covariance, beta factors, and various portfolio selection models utilized by brokerage theoreticians all have mathematical perils unseen by the most sophisticated players, the author argues. He introduces the wave theory of market movements, based on Fibonacci numbers, to the golden ratio. He warns that scams like pump and dump, short and distort, e-mail chat-room diversions, or plain old book-cooking will surely affect an investment; so may arcana like moving averages, regression to the mean, standard deviation, availability error, Benford’s Law, and the Nash equilibrium, not to mention psychological, logical, and belief-system influences. In his generally accessible explanations, Paulos walks the reader through basic formulae and eschews tables and charts—even where they might help. Investors would do well to heed his entertaining, frequently counterintuitive, always useful bean-counting methodology. A first-rate exploration into the math of the market: heuristic numeracy at its best.